The latest family movie from Lionsgate Home Entertainment is Fishtales. Released on Monday 11th July on Digital Download and from Monday 18th July on DVD. 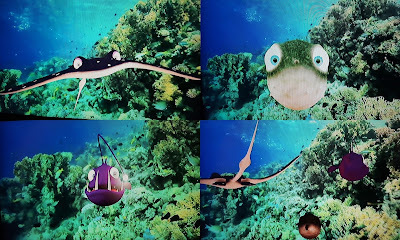 Main characters Ollie, Cleo and Puffer are animated against a backdrop of real underwater footage, and it's actually a lot better than that makes it sound. Think David Attenborough meets Bedknobs And Broomsticks and you get the idea. When their best friend Ollie the octopus is chased by sharks, Cleo the angler fish and Puffer the pufferfish enlist the help of the fun-loving, worldly manta ray, Crash. Crash and Cleo especially know a lot about the undersea world, and explain everything they see as they go a journey of discovery and wonder exploring coral reefs, the open ocean and freshwater lakes in order to find their lost friend. The group encounter and learn about many fascinating creatures including jellyfish, moray eels and sea turtles. My 7 year old has always loved natural history, and he really couldn't take his eyes away from the screen. He loved Fishtales for the information about all of the sea creatures and the underwater footage that's shown throughout. My 6 year old was more interested in the storyline of the fish attempting to find their friend. I actually found it quite relaxing and fascinating to watch. The animation is very obvious and doesn't attempt to blend in with the backdrop. 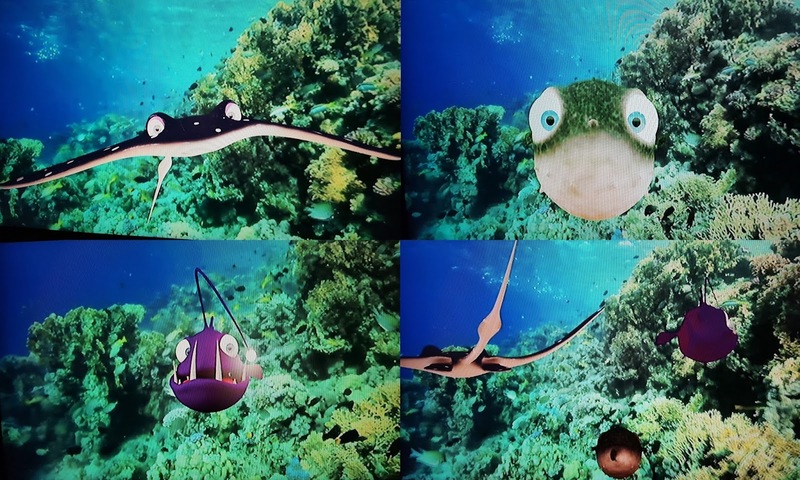 A lot of the time we have close up shots of undersea creatures with no animation. 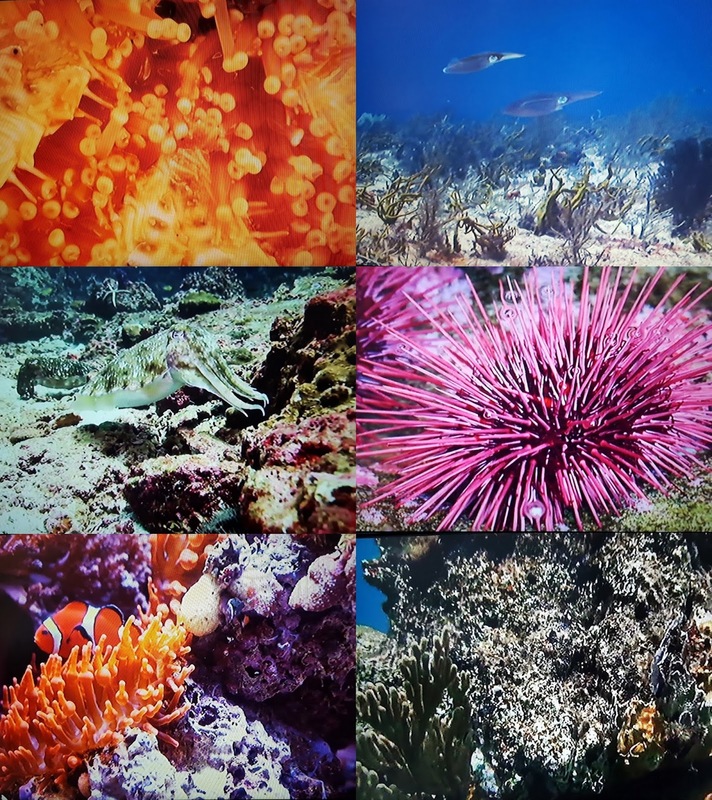 The fish give a commentary in the same way as any natural history documentary fronted by a presenter, and it is really interesting. Pairing it with a 'buddy in trouble' story keeps a whole extra portion of the audience watching, and as such it's cleverly done. A great video for calming down time and relaxing for everyone, although the storyline is a bit simplistic and won't challenge even younger viewers. Fishtales is released on Digital Download on Monday 11th July and on DVD from Monday 18th July. Rated U and with a runtime of 95 minutes. Available from all good stockists in store or online priced around £9.99. 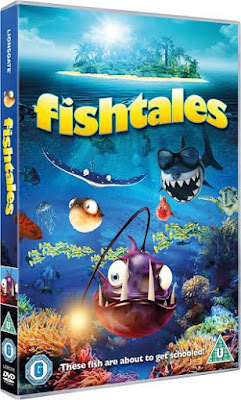 Lionsgate Home Entertainment have offered a copy of Fishtales for one of my readers. To enter the giveaway use the Gleam form below. If you are new to Gleam or want to see my other giveaways, please see my giveaways page. The giveaway will end at midnight Sunday 7th August, and is open to UK entrants only. We were sent our copy of Fishtales for review. I love dolphins because they are so beautiful and intelligent. I love blue tang fish as they remind me of dory! My favourite underwater creature is a stingray because I think they are so cute when they move their mouths! Anything which has a comparison to bedknobs and broomsticks gets a thumbs up from me!!! This looks like something that my nearly 3 year old will love!! She loves the sea and calls everything a fish (trying to tell her that dolphins aren't fish or penguins is becoming rather difficult!!!). I will try and see if I can purchase this from amazon once it is released! I love seahorses they are so delicate and beautiful and the male looks after the babies! Star Fish, they are so pretty and colourful! I love sea horses as they just look so perfect & delicate plus they are really elegant in the way they move. Love jellyfish they are one of a kind only one of a few things people are scared of when going to the beach! killer whales, so big animals but can be gentle too, would love to swim with them one day. Seahorses too, so delicate and magical. I love the blob fish. So ugly it's cute! I love dolphins, such beautiful creatures. Killer whales because they're powerful and big yet vulnerable at the same time. Dolphins, they are beautiful creatures, so graceful and friendly.